LONDON, U.K.—The dominance of global competition by the USA men’s basketball team proved a forgone conclusion until Saturday’s 99-95 win over Lithuania. The narrow margin of victory has since revived questions about whether this 2012 team is as good as the record-breaking 83-point victory over Nigeria on Thursday suggested. 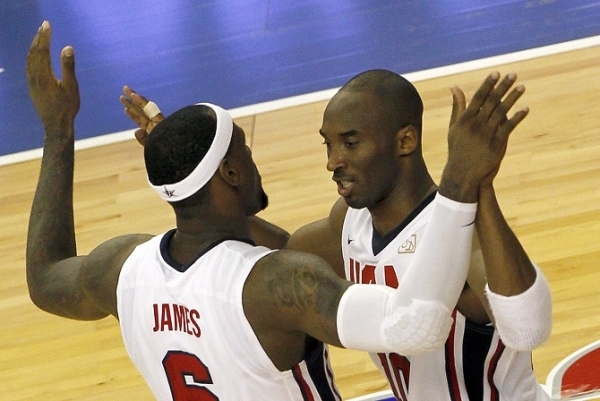 Almost immediately after the Lithuania game, as if an explanation was necessary, Team USA reported that every player has been receiving treatment for stress fractures in their palms suffered by the frequency with which they have been high fiving each other after exceptional play. The coaching staff points to the Nigeria game as the tipping point that brought the injuries to an epidemic level. 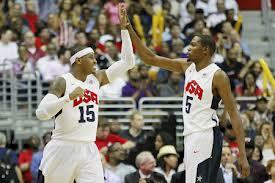 A perturbed Kobe tries to teach the “young fella” Durant to switch to the fist bump, with limited success. 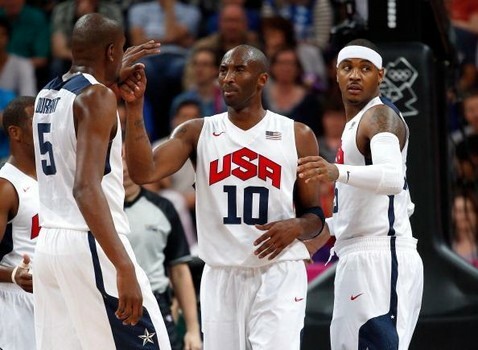 ‘Melo wonders what the hell wife’s film crew is doing there. Team USA’s training staff has already suggested alternative forms of celebration to speed up the healing process, such as the now popular leaping side-bump and the more traditional and stately hand-to-forehead salute. One strategic adjustment that Coach K considered was moving University of Kentucky standout Anthony Davis into a starting role. However, Team USA insiders have revealed that the #1 draft pick of the New Orleans Hornets was diagnosed with carpal tunnel syndrome almost a week before Olympic competition even began. Although Davis remains silent about this condition, Assistant Coach Mike D’Antoni claims that Davis’s Twitter addiction may be the cause. As Monday’s game against Argentina approaches, Team USA has some concerns about the toll that facing an aging but proven Manu Ginobili-led squad will take. The declining depth and talent of the Argentines promises an even scrappier effort to compensate, which will test Team USA before they can attempt to uphold the Gold standard set by the 1992 USA team in Barcelona. The gentler ‘body five’ was abandoned immediately after the blogosphere got a hold of this picture.